Super Critical is one of the most famous strains in Spain and is now available in the Greenhouse Seeds Company catalog. This is a poly-hybrid with Big Bud x Skunk x White Widow ,flowering in just 8 weeks. It is a medium-size, branchy plant. Very good for SoG and ScrOG. This plant owes its success and reputation to its mass production, up to 800 grams per square meter indoors. Outdoors, the flowering period ends in late September and its production is also amazing - up to 1200 gr/plant. The quality of the final product is comparable to its ancestors. 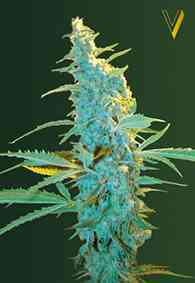 Buds are compact and resin-coated, dense and with a persistent scent. The effect is physical, very fast-hitting, with a narcotic side and a very relaxing finish. Medicinally effective in pain therapy.